We want to charge impact fees to help fund our schools, manage the demands of an increasingly strained transportation system and meet our need for open space as Seattle’s population increases by 1,000-plus people a week. 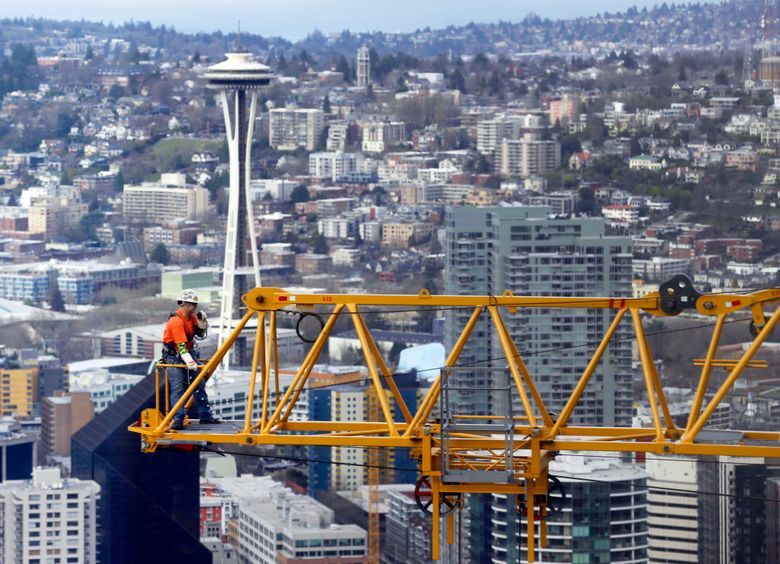 AS elected council members representing three of Seattle’s seven council districts, we were enthusiastic to read editorial columnist Jonathan Martin’s piece, “Builders, not residents, should pay for Seattle’s explosive growth,” [June 15, Opinion]. Council member Lisa Herbold represents District 1 — West Seattle and South Park. Council member Sally Bagshaw represents District 7 — downtown, South Lake Union, Queen Anne/Magnolia. Council member Mike O’Brien represents District 6 — Ballard, Fremont and Green Lake. We want to confirm that we’re underway. The number of construction cranes, traffic delays and construction sites confirm the extraordinary pace of Seattle development. We live in one of the fastest growing cities in the country, with a projected 120,000 new residents and 115,000 new jobs expected to arrive in the next 20 years. And with those new residents and visitors comes an urgent need to further invest in schools, parks and transportation. The need is clear. All aspects of our transportation system require additional funding to meet growing demand. Schools in most neighborhoods are already packed, and residents of Seattle’s downtown — the fastest growing neighborhood in our city — are calling loudly for a public elementary and high school. Seattle Public Schools estimates it needs 28 new classrooms just to keep up with projected growth citywide, and 37 more to meet new class-size reduction laws. And it’s essential we continually improve and enhance our parks and community centers to address increased demand. We believe impact fees represent a reasonable path forward to address some of the stated needs, but we disagree with the assessment that the city hasn’t pursued an impact-fee proposal because we already have property-tax levies or that it’s not a priority. On the contrary, in the last three years we’ve been steadily moving forward toward adopting impact fees. Like all things land use-related, we are never able to move as quickly as we’d like. In late 2014, the city authorized development of a proposal for parks and transportation impact fees, with an additional assessment conducted for education in partnership with Seattle Public Schools. That work continued through 2016, and the council received a draft proposal last fall. Here’s our path forward: on Tuesday, Aug. 1, we will consider a resolution that establishes the 2018 docket of proposed amendments to the city’s Comprehensive Plan (the document that guides how we grow). The resolution directs city departments to analyze and propose amendments to our Comprehensive Plan establishing an impact-fee program. Any proposed change to our Comp Plan must undergo rigorous analysis before the City Council considers it for approval. Unlike for parks and transportation, the city will develop interlocal agreements in collaboration with Seattle Public Schools in order to enact impact fees for schools. If all goes well, the council could act on a Comprehensive Plan amendment as early as the first quarter of 2018. It is only then that we can consider legislation to determine fee details and exactly what benefits would be received. It’s a long but required process. And before anyone decries the fact we’re pursuing impact fees in Seattle, let’s acknowledge that we would be joining Bellevue, Kirkland, Bothell, Issaquah and Renton, all cities in our region that impose them. Seattle isn’t the only city on the rise. We’re aiming to have impact fees help fund our schools, manage the demands of an increasingly strained transportation system and meet our need for open space as our population increases by 1,000-plus people a week. If you think “growth should pay for growth,” or have a perspective whether impact fees are the right choice for Seattle, we encourage you to attend the council committee meeting on Comp Plan amendments at 9:30 a.m., Aug. 1, and share your thoughts.